Hope he doesn’t take revenge by biting my toes at 4AM! Scoop is fast asleep in bed. So fast asleep that when I stopped to say good morning, he didn't move a muscle. Worried by his immobility (he is an old kitty after all!) I touched him to make sure he was still breathing. Scoop just rolled onto his back, opened half an eye, said something that sounded like Mrowf Grumfle Rumph and passed out again. It must have been a busy night! PPS Sorry for the long break. Have been trying to update this page for 8 days now and keep getting that "there were errors" message. Can't figure out what's wrong. Any tips appreciated. There's roast chicken in the fridge and Scoop is determined to snaffle the remains in a late lunch - or possibly a late breakfast as it's just 1PM and he's been having breakfasts on the hour since about 10 this morning. Scoop is now sitting on the rug in my office, showing MEOWrrrrf!!! every ten minutes or so. He's rather like one of those annoying snooze buttons. Au isn't interested. He had a bit of chicken yesterday and that's enough for him for a few weeks. The junior fuzz is more interested in ham and what the cat with the dirty face down the street is up to. I know what will happen. I'll tell Scoop to shut up, to go away, to leve me in peace rather than in pieces, and then I'll get up and give him what he wants. Scoop is a spoilt brat but we love him. Hey, just as well we don't have kids! PS If you want to buy Christmas gifts with a charitable cause, please check out Precious Home Passions and read up on who, what, where, when, why, and how in the Star articles a time of giving and http://thestar.com.my/lifestyle/story.asp?file=/2006/12/9/lifeliving/16269150&sec=lifeliving. Prices for bracelets are in place, the rest will be uploaded by Monday. With one thing and another we forgot to stock up on cat biscuits for the strays in the backlane. When the outside cats lined up for breakfast this morning, I gave them rations from Au's biscuit barrel, and the remains of Scoop's stash of chicken liver. Au gave me a sideways look but as I had some left over, he forgave me. Then I went to the supermarket and remembered to stock up on biscuits but forgot to buy Scoop replacement liver. The look he gave me could have been packaged and used as poison! Luckily I remembered I had put some fish in the freezer in case we ever needed emergency rations. I boiled up the fish, served it neatly chopped in Scoop's best bowl, and stood back. Old fuzzy ate 3 bowls for lunch, and is now shouting up the stairs to tell me he's ready for his first dinner. Guess forgetting to buy liver wasn't such a disaster after all! PS: Milking English, a Logomania column about dairy phrases in English has been published in the Star today. Feedback, comments, strictures on my English all gratefully received. Scoop loves to cuddle. He's a lap cat who enjoys hours and hours of petting. But Au is a hands-off kitty. He loves to play wild games, and he likes having his chin scratched, but he's not fond of being picked up and cuddled. I don't blame him; I don't like being touched much either. So last night when I was mulling over Things To Do this week, panicking over deadlines, and graduating to worrying about the usual career/money/future things people worry about every now and again, I was really surprised to have Au walk over and sit down next to me. He gave me a small smile, curled up with his chin on my arm, and settled down for a quiet purring snooze. Instantly the world looked a better place. Au is just a small cat, but he certainly packs a big punch. PS Here he is, snoozing on his rug in front of his cardboard box. A friend of mine is worried that her neighbours seem less than human to her. The reason, she says, is that they are heartless. She described their casual cruelties to cats. Nasty things that have become so common, it doesn’t even rate a paragraph in the newspapers. Listening to her made me very depressed. And it got me thinking: what is wrong with us? Compared to previous generations we’ve unparalleled opportunities for education, advancement and comfort. So why are we going backwards? Despite the Net, satellite TV, proliferation of books and other communication channels, most of the people I meet have little or no interest in learning about the world around them. They’ll scan a newspaper but they won’t read a book. They’ll watch soaps but not documentaries. They are so afraid to expand their horizons, they even avoid talking to strangers. There is a fear that is creating an increasingly insular society. And among the primary effects of this trend, is the way we treat the animals in our world. Too many people think of cats, dogs, birds, and other animals as things or objects rather than conscious fellow creatures. They think nothing of driving over animals in their cars, of putting poison down in their gardens, or of throwing out a guard dog or animal dependent who is ill or old or inconvenient. They encourage kids to throw stones at animals by drumming it into them that all animals are wild, dangerous, and poised to attack. If we want a nicer world, we need to lose our fear and open up to new experiences. Me, I’m going to start by going out for a walk, giving Scoop a long brush and watching Animal Planet. Hopefully it will cure the Sunday blues. Au crawled under a car last week and picked up an oily spot on his shoulder. With the rapid response rate of a professional salesman, our neighbour handed over the new shampoo he has devised to test out on our junior fuzzy. Since then Au has been conspicuous by his absence on sunny mornings. But we'll catch him. And we'll post him having his bath right here on this spot! PS Here's Au trying to clean off that spot. PPS Katz Tales will be in the print edition of the Star Weekend section this Saturday! Scoop is completely kitty collapso, dead to the world, determined not to open an eye-lid. He's stuffed to the gills with chicken tandoori. We ran out of chicken liver late yesterday afternoon, and Scoop had to make do with biscuits - not a happy situation! So when we went out for a drink (at Kusar Cabana, a great place at 37 Jalan SS15/4E Subang Jaya 47500) we went home via the Indian curry house and picked up a load of tandoori. When he saw what we had brought home, Scoop's sulks vanished. He stuffed his face, washed his whiskers and collapsed. twelve hours later he still has curry breath but he's happy. All he's saying is MAUF! The Star has published Logomania: Boxing clever, an article that looks at some boxing expressions in English. Scoop has appropriated the spare bedroom as his own. He also has his circular stool downstairs, a towel on his outpost in front of the bedroom window, his pick of sofa seats etc. So what does old fuzzy do? He spies an old drawer we are about to throw out in the utility room, and decides this is his favourite spot. There may be a job vacancy coming up in the UK House of Parliament. Apparently mice are taking over the canteen, the bar, and even Commons Chamber. Tony Blair has so far resisted hiring a cat, but as the crisis deepens he will no doubt change his mind, stand on a chair and scream for help. Our neighbour, a chemist extraordinaire, is developing a cat shampoo for a client. Having formulated several “flavours”, he leant over the wall yesterday afternoon to ask if he test new products on Scoop and Au. As our fuzzies have only just had their semi annual baths, I had to decline. I’ve told him that unless they fall into a storm drain, or manage to coat their coats in car oil, there’s no prospect of a bath until Chinese New Year. I’ve warned Scoop not to wander too near the storm drain when our neighbour is about! PS sorry it took so long between posts. Blogger.com seemed to be down! The little black cat passed away last night, probably killed by one of the older cats down the lane. I also found another small body of a kitten I’ve never seen before. A sad start to the day. Good news is that Scoop and Au are fine. Here is Scoop, fast asleep in bed! When I opened up the back door this morning there was a pile of cats stuffed in the corner. All the black girls were there, plus three generations of kittens. Usually the backdoor cats run around in the lane, and come in for breakfast. But for the last week they've been heaped in the shelter of our porch every morning. I think they're hiding from fireworks. We've had bang, crackle, whizz here every night starting from Deepavali and running through Raya. Everyone seems to have the urge to create a lot of smoke and noise. Scoop doesn't bother but Au hides under the table when the ruckus starts. And it looks like the black girls are terrified too. I'm wondering if it will end now or if this is merely a run-up to an almighty spectacular for Halloween. Either way, nobody would guess this stuff is banned! 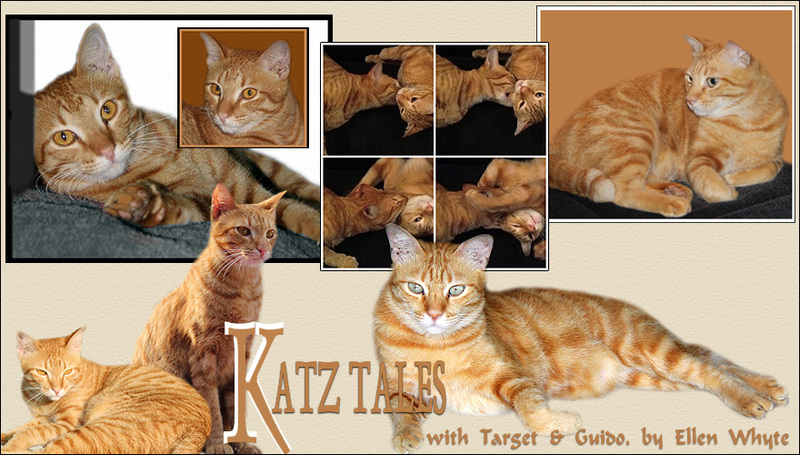 PS Sorry that Katz Tales wasn't published on Saturday. I suspect it was a Hari Raya thing as other regular columns from the paper were missing too. Will check with the ed to see when the next issue is printed. PPS Here is the latest batch of kittens courtesy of one of the back lane black girls. Scoop is fast asleep on the box in front of the bedroom window. He's in that phase where he's out all night, and asleep all day. Scoop's evenings out all follow the same pattern. Old fuzzy goes out at about 11PM. He sits on the wall and watches our neighbours come home from various eateries. And Scoop being a friendly cat, he makes a point of greeting his favourite people. We can hear him shout MEOW! and his friends shouting Hello Scoop! Hello Sayang! The rest of the night is spent patrolling neighbouring gardens and sitting on top of the Beetle so he can see all the way down to the end of our road. From what I can tell, if there is any rat hunting to be done, this starts just before dawn. At least, I hear a strangled PEEP and Scoop comes trotting in ten minutes later, happily showing us his gift for services rendered. The Cat With The Dirty Face staged another reappearance a few days ago, creating spats, fights and general MROUWL-ing fights all over the place. Poor Au had a black eye for a day (see picture). A peaceful silence has descended, and the dirty-faced kitty has taken up position in the back lane, the free zone in our area where all cats meet on equal ground. He’s eating cat biscuits and taking it easy. I’m hoping he'll settle down and end his ambitions of street conquest. We really don't need more wars. PS Au's black eye lasted hours only. He is back to his usual handsome self, complete with wide open, clear and deliciously green eyes. PPS It's Friday the 13th today, a day considered so unlucky in the UK that some people suffer from paraskevidekatriaphobia, an irrational fear of this date. Find out more about this weird superstition by reading Friday the 13th. PPPS Katz Tales is out in the Weekend section of The Star tomorrow. Don't forget to buy your copy! It's a public holiday. I'm not sure what exactly we're celebrating, but we're making the most of it by enjoying a day or peace and quiet. Scoop and Au have had two breakfasts, a wrestle on the big rug upstairs and are now fast asleep in bed. Scoop is curled up in the spare bedroom that he has taken for his own, and Au has thrown himself in the middle of our bed. Normally at this time of day the kitties would be visiting their friends in the street. But the air pollution is just too much for little cat lungs to handle. And the smell offends Their Fastidious Majesties as their friend SM has nicknamed them. Every cloud has a silver lining. Even a smoggy one. PS Here's Au taking it easy. A cat in bed is not just a joy to behold, it's also the perfect excuse for not making the bed. Something's up with Au today. He bounced into bed this morning, and challenged me to a game of handwrestling (rules: one human hand versus four cat paws, no claws allowed). Since then he's been running in and out of the office, wrestling with his rug, ripping up an old newspaper, and generally creating havoc. When I go to the kitchen for coffee, he demands ham, and then invites me to chase him round the room. I haven't seen him in such a good mood in weeks. Must be the rain last night. PS Here he is, having a good scratch. Wish I were as flexible! Scoop wore his lamp shade for a week, and we thought it was having no effect. His face was still sore, and his temper was worse. Every time poor old fuzzy woke up he would panic as he had lost his peripheral vision; also, he was itchy all over. Scoop was really down. When he went for his checkup on Thursday, the vet recommended some more medicine (at RM7.50 or about US$2 a tablet, Scoop is now officially an expensive kitty! ), a new ointment and another fortnight in plastic. We OK'd the medicine but decided that the lamp shade was too much and took it off. It's not easy to go against medical advice and usually not recommended but guess what? Scoop is a lot better! His face is clearing up and we're crossing fingers he'll be handsome again in a month's time. Minus lamp shade Scoop is back to his old self. He's cheerfully belting Au over the head, ambushing us when we walk past his chair and diving back into his social life with real verve. All in all it's been a terrible fortnight. Not just Scoop's illness but also my PC broke down on Tuesday (hence the long silence). Now I've got my PC back and Scoop has his life back we're both back on track. Scoop's manipulative nature is killing me. Knowing we feel so bad for him at the moment, he is bullying us for chin scratches and tummy rubs all day and all night, plus he's worked his way through 250g of steak in 24 hours. That's OK but his night time rambling is not. Having been woken up at midnight, 2AM, 4AM,and 5AM I feel as though I'm reeling with jet lag. While I'm finishing off commissions and hoping to sneak out to the gym for a half hour, old fuzzy is enjoying a fine snooze on the sofa. No doubt he's recruiting his strength for another night of mayhem. Scoop has a sore face, and to keep him from scratching, he has to wear a lampshade for a week or so. Neither Scoop nor Au wear a collar, so the idea of having one fitted with an extension wasn't very popular. When I put it on yesterday afternoon, poor old fuzzy walked backwards for a few minutes, trying to get rid of it, and then realised it was no good. The look he gave me was terrible. I showed him how to keep his head up while negotiating stairs, his favourite chair and other obstacles, and within half an hour Scoop was walking around without a problem. He's still not happy but the scars on his face need to heal and this is the only way to keep his paws off them. I'm staying at home for a week, brushing him 5 or 6 times a day and feeding him bowls of roast chicken. Fingers crossed he gets better soon! Another instalment of Katz Tales will be published in the Malaysian national daily The Star in the Weekend section tomorrow. It's been so hot the last week or so that all of us are wilting. The human people are constantly popping into the shower in vain attempts to cool off, and the cat people are sitting directly under fans, and drinking glass after glass of water. Brushing Scoop who was flat out in front of the fan yesterday I saw spots of dirt on his tummy and immediately thought he had fleas. Luckily for him I checked before chucking him into a bowl of soapy water! It turned out to be plain old dirt fromt he garden. But when Au came home this morning covered in earth too, I realised Scoop and Au are practicing an alternative cooling technique. Watching Scoop march out I got to see it for myself. The trick is to turn over the thick soil under the plants at the end of the garden until you find a nice cool layer of earth. Then you spread this evenly over the ground, throw yourself on top and roll until the cool earth is all through your coat. Neither Scoop nor Au seems to mind that it takes ages to clean off the dirt afterwards, so I suppose the cooling off method does work - or at least have some psychological value. Might go for a roll myself come sundown! PS the picture above is Au cleaning up after a nice roll. Yesterday Scoop sighed over his chicken liver, munched moodily on his cat biscuits, and generally grumbled about falling standards. So when I woke up at 7 this morning and decided to go to the wet market, old fuzzy was happy to push me out of the front door. He may never have set eyes on the place, but he knows it's where all good things come from. On my return, old fuzzy stuck his nose into the groceries, unerringly passing by the tomatoes and spring onions, and aiming straight for the RM2 worth of chicken livers and the whole chicken sitting snugly in the bag beside them. You can drench a chicken in paprika, stuff it with onions and fresh tarragon and surround it with potatoes if you like, Scoop doesn't care as long as he gets his paws on what his considers his fair share of the roast: a generous helping of breast with small slices of juicy leg meat. Of course Scoop always gets what he wants. Having gulped down a huge bowl of meat, he is now lying on the sofa, leisurely licking his whiskers and chatting to Au with satisfied mewaufs that indicate dinner was excellent. From the look of satisfaction on his face it's clear he's anticipating leftovers for supper, breakfast and lunch. It’s a cat's life! Cats can beat up the dog next door, have a few rounds of fisty-cuffs with a rival tomcat, admonish their human personal servant over the size and quality of the evening meal and then, when the entire neighbourhood is quivering with resentment, fall gently asleep on the best part of the sofa. Cats never let anything get in between them and a good snooze. They know that worrying won't alter facts and that exhaustion merely adds to tension. You will never see a cat toss and turn, nor will you see a cat trying to stumble through the day yawning and rubbing their eyes, punchdrunk with lack of sleep. I can't remember the time I slept through the night. Tossing and turning because my stupid brain won't shut up has become routine. Looking at Scoop and Au I've decided I'm going to follow their example. No more worrying about what happened today or what may come tomorrow. I'm going to get a good night sleep and let tomorrow come as it will. PS The picture is of Au taking a snooze in bed. After four days of patient waiting, Scoop caught our mouse guy creeping from the roof and into the bathroom where the night time bowl of cat biscuits is kept. As Scoop was taking his victim outside, I saw its poor frightened face, eyes bulging with terror at the thought of being mauled to death by this huge monster. I grabbed old fuzzy, and told him to drop. Scoop was fuming but he dropped the mouse and growled threats as it scurried off into the bushes at the end of the garden. I hope it's had the sense to go through the drain and into the banana plantation at the end of the road because if it sets a paw in this house again, Scoop will have him for breakfast. PS The Rattus Norvegicus picture was provided by Liftarn who puts his pics on Wikicommons. It's boiling hot, it hasn't rained for a week and both fuzzies are sweating in their fur coats. Being smart cats, Scoop and Au have figured out where all the best cool spots are in the house. Calculating sun exposure, fan settings and breeze factors, they figure out the best way to keep cool is to spend the morning on the downstairs sofa (see pic), the afternoon in our bedroom and the evening on the front doorstep. I'm spending my days trapped in the office which is cool in the morning but like a sauna in the afternoon. I would love to bunk off and spend the day at the pool but there are cat biscuits to be earned. Wish I could be a cat! PS Want to read more about cats? A full Katz Tales column will be published in this Saturday's Weekend section of The Star. Last week's katz Tales column in The Star Weekend was devoted to how dumb I am when it comes to communicating with Scoop and Au. They are both very patient with me, and always take the time to praise me when I manage to get it right: opening a new bag of biscuits at 4AM, leaving my desk an hour before deadline to get Au a fresh glass of water, or whatever else they require. In addition, I wrote I'm convinced both cats seem to have the gift of telepathy. My name is Wa Wa. My daddy calls me Wa Wa Pussyboy, or just Wa Wa or just Pussyboy. When he is angry with me, my name becomes merely Wa! I think many humans are very stupid. Just because they cannot speak or understand our language, they think we do not have a language to communicate with them. I talk with my daddy all the time and he understands me. Other times, I communicate with him in many other ways. I remember there was this time when he stuck a piece of sticky tape around my arm and I could not get it off myself (he is very naughty sometimes! ), I merely had to stretch my arm with the sticky tape stuck on, towards him and he dutifully took the sticky tape off my arm. Just a secret between you and me, frankly I have him wrapped around my fingertips or should I say, my claw tips. I get to boss him around almost all the time and he seems to enjoy that. Even though I am very bossy with him, I do it out of my sincerest love for him. I hate it most when he goes off to work in the morning and leaves me all by myself for the whole day. I always try to stop him from leaving. How? Easy. I follow him around and try to stop him from getting to the door. I grip his legs to stop him from walking. He understands my intention very well but he always manages to get to work alright anyway. When I want to play with him, I only need to bring my toy and leave it in front of him and he would dutifully pick the toy up to play with me. We play many games, including (1) fetch (he throws my toy away and I would pick it up and bring it back to him), (2) wrestling (he tries to cup my head), (3) chase (he would chase me all over the apartment until I surrender) and (4) hide and seek (he pretends not to have seen me and walk away while calling out my name and when I follow after him in a hunting posture, he would turn around to chase me). Whenever I want to go under his blanket, I only need to lift part of his blanket up with my chin and he would let me go under his blanket with no question asked. So, who says we do not know how to communicate. Because my communication with my daddy is so good that I do not even need to use my even more powerful communication skill, my psychic ability. Say thank you to your mummy for sharing her story with you, with us. What do you think? Do cats speak? Are they telepathic? I was reading recently that cats, or the family Felidae if you want to give them their Sunday name, have been around since the Late Eocene Epoch some 43.6 to 36.6 million years ago. Prehistoric cats we would recognise today appeared about 10 million years ago; apart from size and markings that tell you a kitty is a tiger or a lynx or a plain city kitty, the 36 different species of wild cat and more than 50 types of pedigree domestic cat living today have remained almost unchanged in all that time. If like me you want to know more about those mysterious ancient cat ancestors like the Sabre-toothed cat family, the Metailurus, Machairodus, Megantereon, Dinofelis, Homotherium, Smilodon, and Miracinonyx, check out these sites: Prehistoric Cats And Prehistoric Cat-Like Creatures that's quite scholarly and Extinct Species that's filled with great pics. If you want to look at the sabretoothed cat family, check out the Wikipedia article. Fingers crossed the Tiger and its modern cousins don't join these lists! PS Katz Tales is out in the printed version of Malaysia’s national daily The Star Weekend section again tomorrow.